COS COB, Conn. – “How much better would life be if lived with possibility? This book is filled with the stories of people who didn’t heed the negative voice in their heads, who proved the experts wrong, who dug deep and as a result celebrated victories—some monumental, some small,” says Deborah Norville in her introduction to the latest book from Chicken Soup for the Soul. As the award-winning host of Inside Edition, and a journalist, news anchor and entrepreneur, Norville has seen plenty of ups and downs in the lives of the people she covers as well as in her own career. She brought her experience and expertise to the editorial process, coauthoring this book with Amy Newmark, Chicken Soup for the Soul’s publisher and editor-in-chief. Chicken Soup for the Soul: Think Possible (Chicken Soup for the Soul Publishing, LLC; Amy Newmark and Deborah Norville; October 6, 2015, 978-1611599527, $14.95) is filled with stories about people doing the impossible, whether they are overcoming disabilities, achieving success despite predictions to the contrary, coming back from trauma and disasters, or rebooting their lives through just plain positive thinking and force of will. You’ll read stories from people who deliberately became more positive, and transformed their lives as a result. You’ll root for people who followed their hearts and attained the unattainable. You’ll see how using gratitude and forgiveness can change the trajectory of your life. And you’ll meet people who confronted their fears and rose to challenges that none of us think we can handle… until they happen to us. The positive role models in this book are fascinating and inspiring, and you’ll find yourself reinvigorated and ready to take on the world after reading just a few stories. The proof is in these stories, which manage to entertain and inspire us at the same time. They show that we all have the ability to call on resilience and inner strength when needed, and that we really can change our lives through something as simple as deliberate positive thinking. Bestselling author Deborah Norville credits many of the successes in her life to a positive mental attitude. She is the two time Emmy-winning anchor of Inside Edition, the nation’s top-rated syndicated news magazine. She is also the author of a half-dozen books including the New York Times bestseller, Thank You Power: Making the Science of Gratitude Work for You. She also wrote the forewords for Chicken Soup for the Soul: Think Positive and Chicken Soup for the Soul: Find Your Happiness. 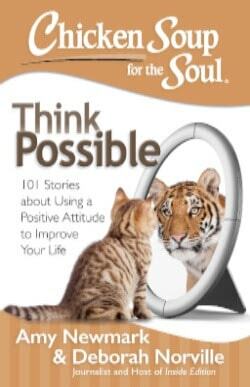 Chicken Soup for the Soul: Think Possible is a must by Chicken Soup for the Soul book. The 101 Think Possible stories inspire to be everything you can be. Whether you are keeping your inspiration and determination going, or needing a little boost, Think Possible will provide great stories that you will surely be able to relate to. Think Possible is another amazing Chicken Soup for the Soul book.